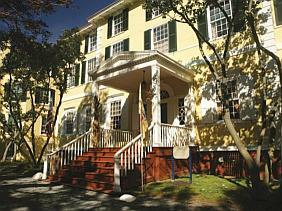 Founded 1845, oldest cultural institution in state. Maintains museum, library, and archives collecting and preserving historic documents, photographs and artifacts. Museums collections comprise over 32,000 objects, including costumes, furniture, paintings, prints, ceramics, glass, tools, toys etc. Sponsors exhibitions, publications, and programs. Limited days and hours for on-site visits. 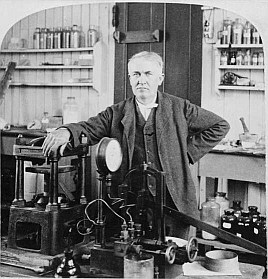 Thomas Edison's laboratories and factory buildings on 21-acre site, where after relocating in 1887 from Middlesex County he developed the motion picture camera, improved phonographs, sound recordings, silent and sound movies and nickel-iron alkaline electric storage battery. Museum includes renovated laboratories, factory buildings, artifacts and collection of 60,000 photographs, also reproduction of "Black Maria," first motion picture production studio built by Edison in 1892. Site also includes nearby Edison family home of ﻿Glenmont﻿. Located on top floor of Greenville branch of Jersey City Public Library. New Jersey African American history and African artifacts comprise books, newspapers, documents, photographs and memorabilia relating to African American history, including New Jersey slave trade, underground railroad, replica of an urban 1930s kitchen, civil rights movement, NAACP in New Jersey, historic African American churches and genealogical records. Features changing exhibits on history of Hoboken, including prominent citizens such as steamboat and railroad pioneers Stevens family, Frank Sinatra, along with artifacts relating to historic sites, immigration, military roles. Also exhibits art work by local artists. Sponsors education programs for school children; events including house tours, garden tours, film festivals and lectures. Museum publishes many of its own books, including series of oral histories titled "Vanishing Hoboken," as well as extensive digital and online exhibits. Founded in 1972, located at Teterboro Airport. Exhibits on New Jersey aviation and space heritage, displays historic aircraft, helicopters, air and space artifacts, photographs, fine art and extensive model collection. Exhibits include rocket engine that propelled X-15 experimental plane to speed and height records and first American hovercraft. Hall of Fame recognizes prominent aviators, engineers such as Charles Lindbergh, Amelia Earhart, Astronauts Mark and Scott Kelly. Silvio Cavalier Research Library includes over 3,000 volumes. Former home of Livingston and Kean families, members include state's first governor, William Livingston (1776-90), Governor Thomas H. Kean (1982-90) and current Republican Senate Leader Thomas Kean, Jr.. Home originally built on land acquired in 1760 by New York lawyer and colonial legislator William Livingston, member of wealthy Livingston family which owned extensive property along Hudson River north of Manhattan. 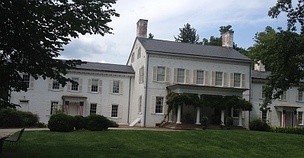 Livingston built 14-room Georgian mansion country retreat on 120 acres in what was then Elizabethtown and later relocated permanent residence in 1772 from New York to Liberty Hall, subsequently elected as first state governor, died at home in 1790 while serving 14th year as governor. Home remained in family ownership until 1970s transfer to Kean University. Currently operated as museum with holdings including family furniture, paintings, memorabilia, letters of Thomas Jefferson and Benjamin Franklin. Adjacent museum houses New Jersey firehouse memorabilia, including three historic engines, Located on Union campus of Kean University. Botto House National Landmark built 1908 for Italian immigrant and silk mill worker, Pietro Botto and wife Maria. House used in 1913 as central gathering place for labor union organizers of Industrial Workers of the World, who spoke on second-floor balcony to crowds of up to 20,000 silk mill workers striking for eight-hour workday in Paterson Silk Strike. Placed on State and National Register of Historic Sites in 1975 and in 1982 designated as National Landmark. Opened to public as museum In 1983, highlights issues of workers, the workplace, and organized labor with special attention to the ethnicity of working people. Features changing exhibits, restored period rooms and Old World Gardens reflecting early 1900s lifestyle of an immigrant family, free lending library and a Museum Store. Sponsors receptions, lectures, teachers' workshops, student programs and other special events. Headquarters and museum of Morris County Historical Society. Home built for Schermerhorn family in 1853, purchased by Augustus and Mary Crane in 1860 and owned by their descendants in Crane and Hone family until donated in 1971 with contents and surrounding five acres to Historical Society. Exhibits and photographs recognize role of Crane and Hone women in both preservation and women’s suffrage movement. Acorn Hall retains most of its original interior design characteristics and furnishings and serves as authentic representation of early upper-middle class suburban life in Morris County. Society sponsors changing exhibits on local history. National Historic Landmark preserves restored eight-acre estate of Stephen Vail, proprietor of Speedwell Ironworks from early to mid-1800s. Morris County Park Commission acquired property in 2002 and opened it to public in 2003. Factory Building, a National Historic Landmark, site of where Stephen Vail's son, Alfred, worked with Samuel F.B. Morse to conduct first successful public demonstration of telegraph on January 11, 1838, making Historic Speedwell ‘Birthplace of the Telegraph.’ Three floors of exhibits profile development of telegraph and to its connections to modern telecommunications. Attached to Factory Building is Wheelhouse with restored 24-foot overshot water wheel. Home includes original furnishings, period antiques, and portraits of Stephen Vail and his first wife Bethiah, painted by Samuel F.B. Morse in 1837 and given to family as gift. Museum housed in Federal-style mansion first built in 1810, currently with nine period rooms and three galleries with rotating exhibitions. 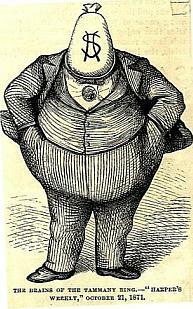 Holdings include nation’s largest collection of original drawings, watercolors and paintings by political cartoonist Thomas Nast (1840-1902), also a Nast Archives with personal correspondence and photographs, including a family photo album. 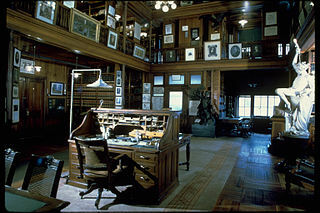 Other collections of antique furniture, carpets, porcelain and, objects related to the US presidency. Museum’s founder W. Parsons Todd (1877-1976) collected porcelain, 18th and 19th-century American and European furniture, paintings, silver, glass, and American textiles like coverlets and quilts reflecting his personal interests in American history, the presidency, maritime life and Macculloch-Miller family who occupied house from 1810 until Todd's purchase of it in 1949. Decorated rooms open to public display include selections from permanent collection and period furniture and accessories. Housed in James Library building built 1899-1900 as Madison Public Library named after philanthropist D. (Daniel) Willis James, head of Phelps Dodge & Co. who had become one of wealthiest in US through interests in mining, finance and transportation. Museum founded 1970 by donation from Agnes and Edgar Law Land of their personal collection of pre-industrial hand tools and artifacts. Core collection from Lands later supplemented by gifts from others, now comprises over 8,800 artifacts related to 21 different trades. Collection consists primarily of hand tools and products produced by them, particularly in wood, metal and leather. Interpretive exhibits focused on tools used and trades practiced in New Jersey. Located at site of Thomas Edison's original laboratories in Menlo Park, then a section of Raritan Township, where he worked from 1876 to 1887, when he relocated to much larger complex in West Orange now preserved at Thomas Edison National Historical Park (above). While at Menlo Park, invented phonograph and incandescent electric light, became known as "Wizard of Menlo Park." Property acquired 1933 by state government, but most of original structures destroyed by fire or deterioration, site now in present-day Edison Township and within Edison State Park consists of Art Deco Edison Memorial Tower and small museum and education center. Original home built in 1750s by Richard Stockton on 150 acres of land first purchased as 5,500-acre tract in 1701 by his grandfather from William Penn. House remained owned by Stockton family into 20th century, rented in 1930s by Robert Wood Johnson II, chairman of Johnson & Johnson. In 1944, New Jersey Governor Walter Edge purchased Morven from Stockton family, subject to condition that Morven would be given to the state of New Jersey within two years of Edge's death, but transferred ownership to the state during 1954, before he died in 1956. Home became official governor's residence for Governors Meyner, Hughes, Cahill and Byrne from 1955 to January 1982. In 1982, upon inauguration of Governor Kean, Governor's Mansion re-designated to nearby Drumthwacket, a larger mansion, and Morven restored and adapted as a museum under state ownership and operated by nonprofit Morven Foundation. Collections include portraits, landscapes and documents related to history of state and mansion. Gardens include restored kitchen garden with vegetables, herbs and other plantings typical of colonial-era gardens. Established 1895 by legislation, first state museum in country established with education as a primary focus of its mission, original focus on natural history with collection of rocks, minerals and fossils from New Jersey Geological Survey. Located next to New Jersey State Library and State House, operated by state government. Fine Arts collection of over 12,000 works includes paintings, prints, drawings, sculpture and photographs, many of New Jersey scenes or by New Jersey artists. Artists represented include Alfred Stieglitz, Ben Shahn and Jacob Landau. Cultural History collection includes over 13,000 artifacts documenting state's cultural, economic, military, political, and social history. Archaeology and Ethnology collection of over 2 million prehistoric and historic specimens from nearly 100 years of excavation and over 2,000 ethnographic objects. Hi-Def Planetarium with precision projection of over 6,000 stars, largest planetarium in New Jersey. Primarily a virtual online museum of history and artifacts from Revolution owned by Swan Historical Foundation with mission to educate people about Revolution. Limited selections from holdings on display at Park include maps, muskets, swords, newspapers and manuscripts, including rare first edition of Thomas Paine's pamphlet entitled Common Sense. Site of steel mill and workers' village of Kinkora Works of John A. Roebling and Sons Company, maker of steel and wire used in construction of Brooklyn Bridge, Golden Gate Bridge and other projects. Factory built in 1905, supplemented Trenton plant opened 1848, continued operation under Roebling and subsequent owners past mid-20th century. Roeblings built over 750 houses for workers' families, two workingmen’s hotels and inn, general store, drug store, bakery, auditorium with a library, and recreation hall. Museum in original factory gatehouse, exhibits feature Roebling family, evolution of company, major projects and life of workers. Objects include strand and wire rope, machinery, wooden patterns of machine parts, photographs, paintings and drawings. Roebling Historical Society, which transferred them to the Museum in 2009. Operated by nonprofit Navy Lakehurst Historical Society on grounds of Lakehurst Naval Air Station, site of development of Navy airships and famous crash and burning of German Zeppelin Hindenburg on May 6, 1937. Museum includes extensive collection of models of Navy ships and aircraft, uniforms, equipment, also replica of gondola of Hindenburg used in 1975 motion picture "The Hindenburg." Walking tours include site of Hindenburg crash, hangars and other buildings. On-site visits require two-week advance notice for appointments. Operated by New Jersey National Guard with main museum at its Training Center in Sea Girt. Collection includes an outdoor military vehicle and aircraft collection, only Civil War cannon mounted on a carriage on museum display in New Jersey, a Civil War era submarine, and 19th & 20th century small arms collection. Museum also houses extensive manuscript and photograph collection, featuring original and copy material relevant to state political and military history. Holds largest collection of New Jersey related Civil War research material in country, including copies of diaries, letters, newspaper clippings, memoirs, regimental histories and articles. Features rotating exhibits, including current on 70th anniversary of D-Day, and New Jersey National Guard role in liberation of Europe during World War II with chronological history of 102nd Cavalry Group’s progress from the beaches of Normandy to war’s end, as well as experience of New Jerseyans on home front and state's role in manufacturing war materials. Lawrenceville Annex located at Artillery Armory in Lawrenceville with exhibits of weapons, uniforms and other equipment from various periods of service along with about 20 tanks, vehicles and cannon on display outside. Operated from 1811 through 1965 as prison, when closed in 1965 oldest operating prison in US. Designed by Robert Mills, first native-born and trained architect in US with vaulted ceilings of poured concrete and brick and stone construction. Subject of media accounts of paranormal activity, including haunting by male uniformed ghost in basement. Operated as museum by non-profit Prison Museum Association which conducts fundraising, and tours. Designated National Historic Landmark. Corson Poley Center contains library and museum, Children’s History Center and three historic houses: Bard-How House, Capt. James Lawrence House and James Fenimore Cooper birthplace. Collection includes art, furniture, quilts and tools, as well as marble mantle from Joseph Bonaparte's estate in Bordentown, chair crafted by William Penn’s son John, rickshaw from Birch carriage company, 19th-century photographs of Revolutionary War veterans, Civil War letters written by a young soldier to his sister, tall case clocks crafted in 18th-century, and door handle of print shop that employed young Benjamin Franklin. Holds over 3,000 objects in collection, including furniture, household items, books, paintings, ceramics and advertising of or related to African Americans, some with stereotypical images or depictions such as Little Black Sambo, Amos & Andy and Buckwheat. Founded 2002 by Ralph E. Hunter, Sr., a retired retail executive with personal collection, relocated to Noyes Arts Garage of Stockton University in Atlantic City in 2013, additional location in Newtonville. Features photos and memorabilia from Atlantic City's Northside African-American neighborhood depicted in Boardwalk Empire book and television series, including original Club Harlem door and sign. 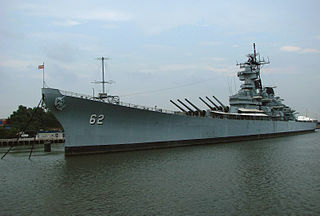 Battleship first launched December 1942 from Philadelphia Naval Yard, engaged in major action in World War II, Korean War, Vietnam War and in Middle East until decommissioned for last time in 1991, donated by Navy to non-profit Home Port Alliance in Camden in 1999 and opened as a museum ship in 2001. Self-guided tours, guided group tours, and overnight encampments offered on ship. 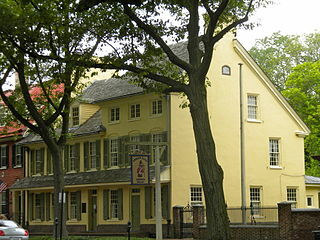 Colonial tavern and inn built circa 1750 in which New Jersey Provincial Council and General Assembly met from January 29 to March 18, 1777, and later in May and September of that year while British armies occupied towns to north, to officially approve independence, adopt state seal and enact first laws as a state. "Great Room" on tavern's second floor was area's largest non-religious public meeting hall. 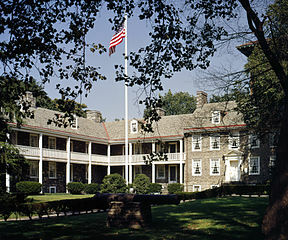 Continued under private ownership as tavern and inn until 1901, became New Jersey’s first state-owned historic site in 1903, now operated by Department of Environmenmtal Protection. Nonprofit Friends of the Indian King Tavern raises funds for restoration, conducts tours and hosts several open house programs each year with re-enactors, period musicians and speakers. Tavern has period furnishings and housewares, upstairs "Dolley Madison Room" includes bed in which she is claimed to have slept in at a nearby home while a frequent visitor to Haddonfield in 1780s, prior to her marriage to later President James Madison. Childhood family home of women's suffrage leader Alice Paul (1885-1977) maintained by nonprofit Alice Paul Institute. House built circa 1800 on site of then 125-acre farm includes exhibits and also serves as girls leadership development center. Ground floor showcases Paul’s diplomas, family mementos, and suffrage memorabilia, third floor houses Alice Paul Archives and Women’s History Library. Institute sponsors lectures and leadership workshops.